I took my time out to write this review because I didn't want to leave anything out! I went to Montego Bay with little to no expectations but I left with so many memories and life-changing experiences... thanks to Mr Gabriel! Such an exceptional host, one of the best hosts I've had in all my many years of traveling. He went above and beyond, was there for me when I needed him and made me feel at home! I was only at the piece of paradise for a few days but I had the time of my life! The place it’s amazing and has a great location. All the areas are clean, I love that. A place where they make you feel like home, great guest and a fantastic host. I totally recommend the place. Such friendly & helpful staff. Gave loads of advice, aswell as a free lift towards my next destination. Great place to stay in Montego Bay. Staff is very nice and the property is very clean. The dorm is simple but very nice. Staff helps when you need it. We had a great time here and I would recommend it to everyone! The hostel is quite close from the airport(about 5 minutes drive), and also has supermarket and quite close attractions from a short drive distance. 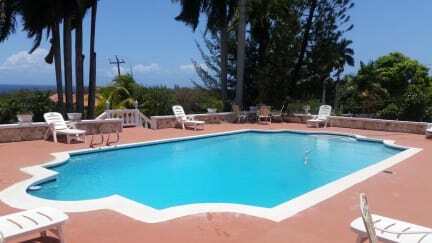 Everything is really quite clean and there is a patio with a very cool chilled pool area where we can all hang out, and also a living room with pool and table tennis for everyone to use! However Gabriel (the owner) is most definitely the soul of the place, made us feel welcome and guaranteed the best possible experience! Great place had lots of fun! I Stayed at that Hostel Two times during my vacation in Jamaica. The House is Good for the Prize and the Pool clean. But The best Part of the Hostel is the Manager Donna. She is a nice, helpfull, fun to hang out with Girl from England. She showed me the best Time and Made Sure i Feel like being at home. Id always come back to her. The hostess, Donna was very accommodating and helpful. The location was a little off the beaten track but in a very safe neighborhood. I loved sitting by the pool and looking at the view. I feel there were a few simple creature comforts that would have made my stay there more pleasant. I would like to see a shelf and some hooks along with a working shower head in the bathroom as well as lamps, shelves, hooks and at least one chair for the dorm. Otherwise, Bravo! Had a great time, Donna was amazing !